My sister and I just love sushi. It is one of the things we miss the most when we are away so we have recently decided to make our own. 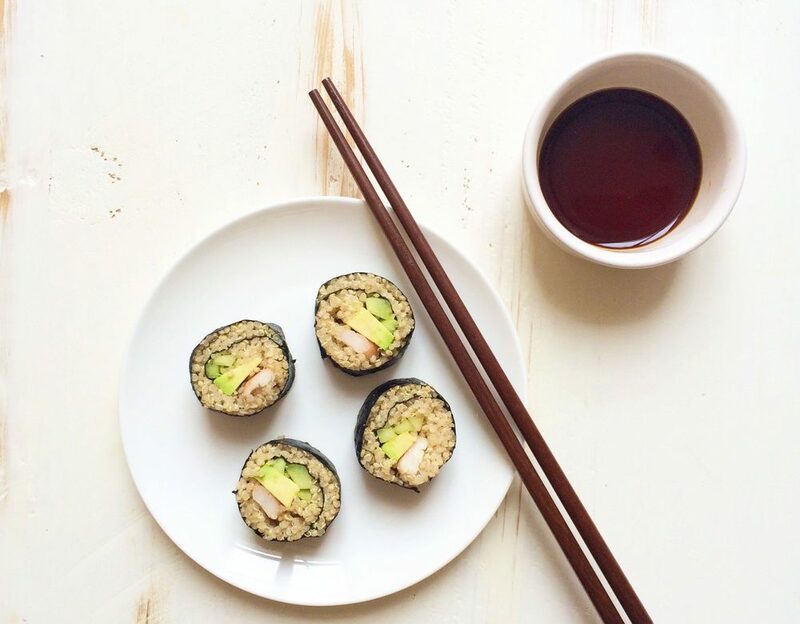 We decided to use quinoa to make the sushi healthier since quinoa is a great source of protein. You can really use any ingredients you like. We love the creamy texture and the goodness of avocado which is rich in healthy fats so we combined it with prawns and cucumber. Making your own sushi roll can be a little tricky at first. You may like to use a sushi rolling mat to help you with the rolling. Another useful tip for beginners is not to use too much quinoa if this is your first time making sushi. Don’t ever be afraid to experiment and try different things in the kitchen. Cooking is supposed to be fun. My sis and I are not chefs. We often make a few mistakes along the way but it is part of the fun and we try to create simple, healthy, tasty meals for you all that we hope you will enjoy. It is a good idea to prepare all your ingredients beforehand. Cook the quinoa with a pinch of salt. Make sure the quinoa is cold when you spread it on the nori sheet. Sauté the prawns with the garlic and sesame oil and set aside to cool. You can steam the prawns if you prefer. By cooking them in the garlic, chilli and sesame oil it gives them more flavour. Peel the avocado, remove the stone and slice into strips. Cut the cucumber. Once all your ingredients are ready you can start to place the ingredients on the nori sheets. Start by placing your nori sheet on a flat surface or a rolling mat. Spread the quinoa onto the nori sheet in a thin layer. Make sure you leave a gap at the end of the nori wrap furthest away from you. This gap is important for sealing the wrap at the end. Place a few slices of avocado on top of the quinoa closest to you, then place a few prawns on top followed by a long strip of cucumber. Here comes the tricky part, rolling the nori sheet. Roll the nori sheet starting at the end closest to you, rolling over the ingredients gently but tightly. Keep rolling toward the opposite end . Seal the roll by moistening the opposite end pressing tightly. Using a sharp knife cut the roll into small pieces. Serve with tamari sauce and enjoy!